The Law Enforcement Officers Safety Act (LEOSA) is a United States federal law, enacted in 2004, that allows two classes of persons - the "qualified Law Enforcement Officer" and the "qualified retired Law Enforcement Officer" - to carry a concealed firearm in any jurisdiction in the United States or United States Territories, regardless of state or local laws, with certain exceptions. 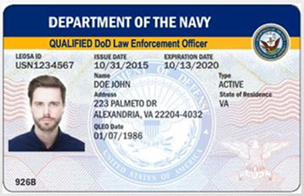 Prior to submitting the LEOSA application, please visit the Navy CNIC website to review the application checklist, obtain the Endorsement template and SECNAV 5580/1. That link can be found HERE. To begin the application process you must create an account. This can be done using the ‘Sign Up’ menu located at the top of the page. Once you have created your account, you’ll be prompted to complete and submit the LEOSA application, upload applicable materials and make payment. The Frequently Asked Questions (FAQ) page may answer any questions related to the application process. Incomplete or incorrect applications will result in applicants being contacted and asked to provide additional information. AUTHORITY: 10 U.S.C. 5013 Secretary of the Navy; 10 U.S.C. 5041Headquarters, Marine Corps function, composition; 18 U.S.C. 922 Unlawful Acts; 18 U.S.C. 926B and 926C Carrying of concealed firearms by qualified retired law enforcement officers; DoD Instruction 5525.12 Implementation of the Law Enforcement Officers Safety Act of 2004 (LEOSA); and E.O.9397 (SSN), as amended. SORN NM05580-2, Security Incident System: http://dpcld.defense.gov/Privacy/SORNsIndex/DOD-wide-SORN-Article-View/Article/570445/nm05580-2/ PURPOSE: To determine eligibility of requesters and process applications for DON law-enforcement credentials. The applicant's Social Security Number is solicited solely for the purpose of validating identity. ROUTINE USE(S): Information will be disclosed to law enforcement authorities and administrative support staff assigned to the issuing agency with a need to know in order to verify Title 18, Section 926B and 926C eligibility requirements and process applications. Additionally, the answers and any information resulting therefrom may be disclosed for use in a criminal or administrative proceeding if the applicant knowingly and willfully provided false statements or information. DISCLOSURE: Voluntary. However, applicants that fail to provide the requested information will be denied issuance of DON law-enforcement credentials. The public reporting burden for this collection of information is estimated to average 30 minutes per response, including the time for reviewing instructions, searching existing data sources, gathering and maintaining the data needed, and completing and reviewing the collection of information. Send comments regarding this burden estimate or any other aspect of this collection of information, including suggestions for reducing the burden, to the Department of Defense, Washington Headquarters Services, Executive Services Directorate, Directives Division, 4800 Mark Center Drive, East Tower, Suite 03F09, Alexandria, VA 22350-3100 0703-0067. Respondents should be aware that notwithstanding any other provision of law, no person shall be subject to any penalty for failing to comply with a collection of information if it does not display a currently valid OMB control number. PLEASE DO NOT RETURN YOUR RESPONSE TO THE ABOVE ADDRESS. Responses should be sent to: Commander, Navy Installations Command, 716 Sicard St, SE, ATTN: James Callahan, LEOSA Program Manager, N3 Anti-Terrorism/Force Protection Branch, Washington Navy Yard, DC 20374-5140, 202-433-9567 Marine Corps: Colonel Zachary M. White, Marine Corps Policy Official, Head, Law Enforcement and Corrections Branch, Security Division, Plans, Policies and Operations (PP&O), Headquarters, U.S. Marine Corps, 3000 Pentagon Room 4A324, Washington, DC 20350-3000, 703-692-4247. ©Defense Consulting Services 2019— All Rights Reserved.